Dr. Michael Charles Tobias and Jane Gray Morrison are world-renowned ecological philosophers and activists, interdisciplinary social and environmental scientists and broad-ranging, deeply committed humanists. This collection of fifty essays and interviews comprises an invigorating, outspoken, provocative and eloquent overview of the ecological humanities in one highly accessible volume. The components of this collection were published in the authors’ "Green Conversations" blog series, and pieces in the Eco News Network from 2011 to 2013 and feature luminaries from Jane Goodall to Ted Turner to the Secretary of the Smithsonian Institution to the former head of the UN Convention on Biological Diversity. 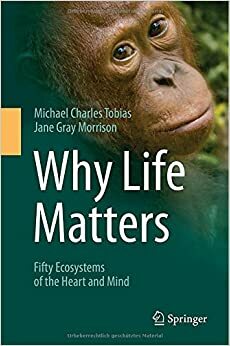 Stunning color photographs captured by the authors and contributors makeWhy Life Matters: Fifty Ecosystems of the Heart and Mind a feast for the eyes as well as the mind and soul. Ethics, science, technology, ecological literacy, grass-roots renaissance thinkers, conservation innovation from the U.S. to the U.K.; from India to Ecuador; from Bhutan to Haiti; from across Africa, the Neo-Tropics, Central Asia and Japan, to Rio, Shanghai and Manhattan – this humanistic ode to the future of life on earth is a relevant and resonating read. Michael Tobias and Jane Gray Morrison, partners who between them have authored some 50 books and written, directed and produced some 170 films, a prolific body of work that has been read, translated and/or broadcast around the world, have been married for more than a quarter-of-a-century. Their field research across the disciplines of comparative literature, anthropology, the history of science and philosophy, ecology and ethics, in over 80 countries, has served as a telling example of what two people – deeply in love with one another – can accomplish in spreading that same unconditional love to others – of all species.